This guide follows the Stuart Highway through arid land north from Port Augusta over into the Northern Territory at the Erldunda Roadhouse. The only towns on the route are Woomera and Coober Pedy. Woomera is an army base. Coober Pedy is a frontier opal mining town where most people live underground to escape the hot weather. Coober Pedy is very different and unlike any other town. It caters for tourists and is worth staying overnight. Otherwise there are also roadhouses every 200km or so. Roadhouses have petrol, food, accomodation and basic vehicle repairs available. The region is hot dry and arid. It is extremely remote as soon as you leave bitumen Stuart Highway. Do not drive your vehicle on remote gravel tracks without notifying authorities and taking proper precautions. Pimba has a service station - Spud’s Roadhouse - at the junction of the Stuart Highway and the side road to Woomera. Woomera is a dry and quiet isolated army town in arid lands 10km off the Stuart Highway. Its sole reason for existance is as a Australian and American military rocket launching and space observation. Spare army barricks are now being used to house asylum seekers from the middle east, something which has brought the Australian government criticism for inhumanity. Woomera has a space museum, a small shopping centre with supermarket and two accommodation options. Woomera Travellers’ Village has backpacker accommodation. Phone 08 8673 7800. Single $15 with fan, $17 with air-con. Double $20 with fan, $24 with air-con. On-site vans with air-con from $25. Self-contained cabins $60. Motel units $45. Communal kitchen. u u ² Woomera Eldo Hotel. Kotara Crescent. Phone 08 8673 7867. 20 units at $75. 136 rooms are cheap with shared bathroom from $33. From Woomera the side road continues north to the modern mining town of Roxby Downs and the frontier opal mining town of Andamooka. Glendambo has two service stations. u u Glendambo Tourist Centre is quite pleasant. Stuart Hwy. Phone 08 8672 1030. It has 60 units. Single $50-$75, double $55-$80. Dorm beds are $12. Pool, laundry, barbeque, bar, restaurant, petrol. BP Road house and Caravan Park Stuart Highway. Phone 08 8672 1035. On-site vans $25 (no air-con). Opal is a precious stone found mostly in Australia and Coober Pedy is the world’s biggest opal mining town. It is a rough and ready but friendly frontier town in desolate dry country. Around Coober Pedy nothing grows, it rarely rains, and water is scarce and expensive. The movie Mad Max II was filmed in the desert surrounding the town.The earth is soft, the minerals are not buried too deep and opal mining equipment is not excessively expensive. Consequently the town is full of small partnerships and solo miners with their own hole trying their luck. The soft earth allows many people to also dig themselves underground homes to escape the intense heat outdoors. Most of the town’s popluation lives underground. For a real experience try staying at one of the underground motels or backpackers hostels! There are numerous opal shops and the prices are cheaper. There are also some mine tours for tourists. The main street, Hutchinson St, is still dusty and is lined with parked utility vans loaded with homemade mining explosives. 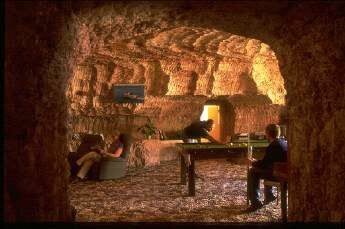 A visit to Coober Pedy will be memorable - no where else is like it. Picture: Houses are built underground to escape the heat. Umoona Opal Mine and Museum is on the main street. It only stopped mining a few years ago when mining was banned on the main street. It has a underground opal shop, historical display and mine tour. Desert Cave Hotel, also on the main street, has a good underground historical display and opal shop. There are numerous other opal shops. Generally prices opal prices are cheaper here than in the cities. The underground bookshop is a useful information centre. You can enquire about tours to outlying mines and joining the Oodnadatta and William Creek 600km mail run along dusty roads for $60 - a way to see some really remote places but without taking your own vehicle. The mail run is Monday and Thursday. Joe’s Backpackers Oliver St, part of the Budget Motel. Phone 08 8672 5163. Bed in underground dorm $14. Free transfer from bus station and airport. Backpackers’ Inn Oliver St, part of the Radeka’s Downunder Motel. Phone 08 8672 5223. Dorm beds in 4 bed underground alcoves $14, twin/double $35. Kitchen, laundry. Free transfers to/from bus station and airport. Opal Cave Bedrock is basic. Hutchinson St. Phone 08 8672 5028. Dorm $12. Limited kitchen facilities. u u u u Desert Cave Hotel Hutchinson St. Phone 08 8672 5688. 50 units of which 19 are underground. Single/double $145, triple $160. Pool, spa, sauna, gym, restaurant. u u u The Coober Pedy Experience Motel. Crowders Gully Road. Phone 08 8672 5777. 10 underground units. Single $80, double $90. Flag Inn chain. u u u The Underground Motel Catacombe Rd. Phone 08 8672 5324. 8 units. Single $65, double $80. Includes breakfast. u u ² Radekas Downunder Motel Oliver St. Phone 08 8672 5223. 8 units of which 6 are underground. Single $55-$65, double $65-$75. Shared kitchen. Umoona Opal Mine Hutchinson St. Phone 08 8672 5288. 7 undergorund rooms. Single $15, twin $25. Limited shared kitchen facilities. Kendall Airlines / Ansett flies from Adelaide for $262. Phone 131300. The Desert Cave Hotel runs the airport shuttle bus into town ($5). Most hostels will pick up if you ring ahead. Stateliner buses to Adelaide cost $82. They stop in coober Pedy at the Ampol service station on the main highway. Greyhound Pioneer buses run to Adelaide ($87), Yulara (Ayres Rock) ($66), Alice Springs ($70) and beyond. McCafferty’s buses stop at John’s Pizza on the main street. Alice Springs is $69. Cadney homestead operates a road house here. u u ² Cadney Homestead Motel Stuart Hwy. Phone 08 86707994. 6 units. Single $70, double $77, extra child $3.50. There may also be cheap basic accomodation. This is a small service town for travellers and the far north of South Australia. 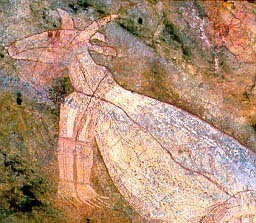 The population is predominantly Aboriginal. From Marla the unsealed Oodnadatta Track leads off to Oodnadatta and William Creek then Maree where it meets a bitumen road. Do not drive your vehicle on remote unsealed roads without the proper precautions and preparations - contact local police before setting off. u u ² Marla Travellers Rest Hotel Motel Stuart Hwy. Phone 08 8670 7001. 49 units. Single $59-$69, double $65-$75. u ² Kulgera Roadhouse Hotel Motel Stuart Hwy. Phone 08 8956 0973. 10 units. Double $42-$65, extra child $6. Barbeque. From Erlunda go east to Ayres Rock (Uluru), Australia’s most famous attraction. There is a accomodation at Yulara near The Rock. While at Ayres Rock also visit The Olgas (Kata Tjuta) and Kings Canyon if time permits. After that, return to the Stuart Hwy and head north to Alice Springs (For the adventurous there is a back route to Alice Springs for 4WDs only). South from Woomera you will eventually come to Port Augusta. This town has many road and rail cross routes passing through. From Marla the adventurous may instead consider taking the Oodnadatta Track south through Oodnadatta, William Creek and Maree. Copyright (c) 2001 Graham Warren. Backpackers Guide to Australia (TM) is a trademark.